Seasonal nitrate supply was computed in the four major Eastern Boundary Upwelling Systems (EBUS): California, Peru, Northwest Africa and Benguela (see Data available for download). The upward flux of nitrate is calculated by taking the product of vertical transport, estimated from satellite winds, and nitrate concentration in the upwelled waters, estimated from measured in situ vertical profiles (the depth of source waters is taken as 60 m). Upwelling can result from two different processes (figure below): (1) coastal upwelling (Ekman transport) generated by the alongshore component of the wind stress next to shore, and (2) Ekman pumping resulting from wind-stress curl, considered here up to 150 km offshore. Both are computed at the winds original 8-day temporal resolution and averaged into a monthly climatology, only keeping positive values (upwelling). The reason is that phytoplankton don’t respond to downwelling (except if they haven’t had time to consume previously upwelled nitrate). Nitrate supply by coastal upwelling and by Ekman pumping are calculated separately by multiplying the seasonal vertical transport and nitrate concentration at 60 m, and then summed. The original method (Messié et al., 2009) was later modified to take into account the effect of onshore geostrophic flow: coastal upwelling is now computed as Ekman transport minus the onshore geostrophic transport (see Messié and Chavez, 2015). Schematic representation of the nitrate supply calculation from satellite-derived Ekman transport and pumping and in situ nitrate concentration in an EBUS. Reference: Messié et al. (2009) Fig. 2. 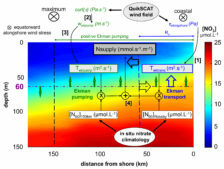 In EBUS where upwelling is the primary source of new nitrate, wind-driven nitrate supply represents the amount of nitrate available for phytoplankton primary production. Converted into primary production units (gC/m²/year) using the Redfield ratio C:N=106:16, this also represents the potential new production of the system, i.e. the new production that would be achieved if all nitrate supplied was consumed by phytoplankton. In reality, other factors may inhibit primary production (e.g., iron limitation, light limitation, physical export) such that not all nitrate is consumed. The N-ratio is defined as the ratio of potential new production to primary production (schema below). It increases with inhibiting factors, thus representing an indicator of primary production regulation by nitrate vs. other factors. We consider that in EBUS, nitrate regulates primary production when N-ratio < 0.5 and other factors regulate when N-ratio > 0.8. (see Messié and Chavez, 2015). N-ratio definition and concept. Nitrogen available for primary production (PP) comes from new (mostly nitrate) and regenerated (mostly ammonium) sources. Part is consumed by PP, sum of new (NP) and regenerated (RP) production. When nitrate is not limiting, a fraction of the available nitrogen cannot be consumed (N-remain). Ammonium is consumed preferably before nitrate so that N-remain comes from potential NP. Because seasonal f-ratio is expected to be relatively constant in productive systems like EBUS, N-remain and the potential NP co-vary so that N-ratio increases with inhibiting factors. Reference: Messié and Chavez (2015) Fig. 2. Messié, M., J. Ledesma, D.D. Kolber, R.P. Michisaki, D.G. Foley and F.P. Chavez (2009). Potential new production estimates in four eastern boundary upwelling ecosystems. Progress in Oceanography, 83(1), 151-158, doi:10.1016/j.pocean.2009.07.018. Messié, M. and F.P. Chavez (2015). Seasonal regulation of primary production in eastern boundary upwelling systems. Progress in Oceanography, 134, 1-18, doi:10.1016/j.pocean.2014.10.011. Messié, M. and F.P. Chavez (2017). Nutrient supply, surface currents and plankton dynamics predict zooplankton hotspots in coastal upwelling systems. Geophysical Research Letters, 44, 8979–8986, doi:10.1002/2017GL074322. Data used in Messié and Chavez (2015): Seasonal monthly products in a 150 km coastal band, at 0.25° latitudinal resolution in the four major EBUS. Variables include nitrate supply from coastal upwelling and Ekman pumping, total nitrate supply, potential new production and N-ratio. Data sets used in the calculations are QuikSCAT winds, AVISO geostrophic currents, in situ nitrate concentration from various databases (mostly NODC), and satellite primary production from the ocean productivity site (only used for the N-ratio). Data (NetCDF files): California (28-48°N), Peru (20-0°S), Northwest Africa (10-30°N), Benguela (35-15°S). Please refer to the above publications when using these products. Contact: monique@mbari.org.